Brick Town Talk: Town of Ararat in 1972 - LEGO Town, Architecture, Building Tips, Inspiration Ideas, and more! Tim Gould and Mike Pianta have created a terrific rendition of the Australian town of Ararat back how it was in 1972. 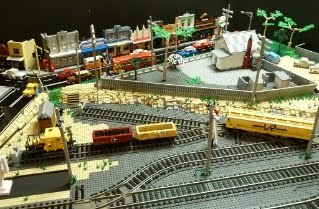 Complete with angled city streets, train tracks, and very well-detailed terrain features such as the sand dirt and brick built trees, it's easy to get lost in its detail. Check out more pictures on Brickshelf! Courtesy Ararat 1972 by gambort. Welcome to the Ararat Hotel!